Like it or not, your practice needs online reviews. When in need of a new service provider, the first course of action for most of us is to search online. Once we find a list of providers who can potentially deliver what we need, most of us then look at the quality of online reviews, how many reviews there are, and how recent they were posted. Boost your positive online reviews and Findability with Review Builder. With Review Builder, Dawson Pediatrics increased their Google reviews by 468% and their star-rating climbed by 41%. 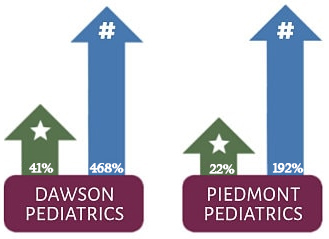 Piedmont Pediatrics saw an 192% increase in positive reviews on Google, and a nearly 22% improvement in their overall star-rating in only a few months. Having a strong list of recent, positive reviews can help new patients find your practice, select your service and help your business grow. RemedyConnect’s Review Builder will help you get the online reviews you need. With Review Builder, following a visit, your patients will receive a text (or you can direct them to your website) asking them to provide feedback about your service. If they rank you 4 or 5 stars, your patients will immediately be directed to Google Reviews and asked to post a review. If they rate your service 3 stars or below, they will be redirected to a survey page, featuring custom survey questions developed by you, where they can provide feedback about your practice and/or an individual provider and the service they received during their visit. This can help your practice to improve its service as well as give your patients a direct line of communication to provide feedback, perhaps instead of posting a negative review online.